The "cobrina" collection is the result of a collaboration with Hida Sangyo, a well-established furniture manufacturer in Japan. ("cobrina" derives from the Japanese expression "koburi-na" used to describe things that are smallish or undersized.) The latest addition to this collection is the cobrina desk series, which is characterized by a light-framed design with soft and rounded shapes and can be used by children and adults alike. Whether found in the living room or the dining room, this compact furniture lineup will fit perfectly with its surroundings. 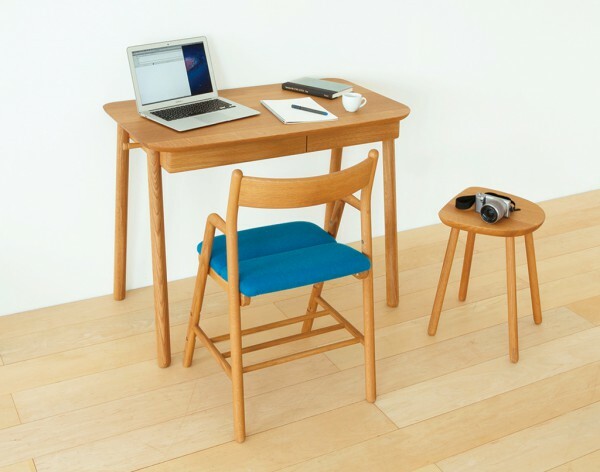 The cobrina desk can be used for long periods of time by a child or an adult thanks to its simple design characterized by slender slanting legs and conical wooden pegs on both sides from which to hang a school bag, etc. 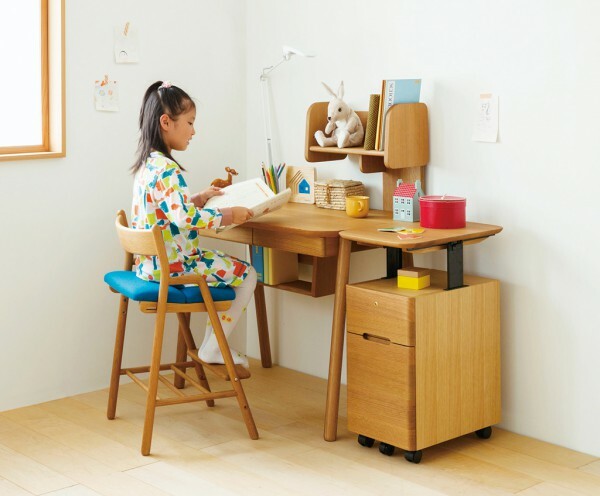 As an option, the desk can be complemented with matching accessories, such as wagon, bookstand or shelf, which can be arranged to fit one's needs. The cobrina wagon features a rounded top surface that echoes that of the cobrina desk. Furthermore, the top plate can be elevated to reveal storage space or locked at desk height to increase desk space. The cobrina bookstand is a panel type bookstand that holds a shelf above the cobrina desk in order to maximize available space. The bookstand can be positioned on either the right or left side of the back of the cobrina desk while the movable shelves can be reconfigured to accommodate objects of various sizes. The cobrina shelf is a compact shelf that makes efficient use of the dead space found under the desk, and can be fixed at either the right or left side of the back of the desk. The cobrina deskchair can be used for long periods of time by a child or an adult thanks to an adjustable seat plate and footrest design that naturally allows the back to straighten while a rack allows for items, such as a school bag, to be neatly stowed under the chair. The cobrina hanger rack has a raised bottom plate and a light frame that lends more volume to the space. It also features four pegs that can be rearranged in different directions while their height can be adjusted to accommodate objects of various sizes.